If You Don’t Vote Trump, You’re Voting for Clinton! You’ve likely heard that before. Please allow me to go on record saying that this. is. not. going. to. happen. Ever. 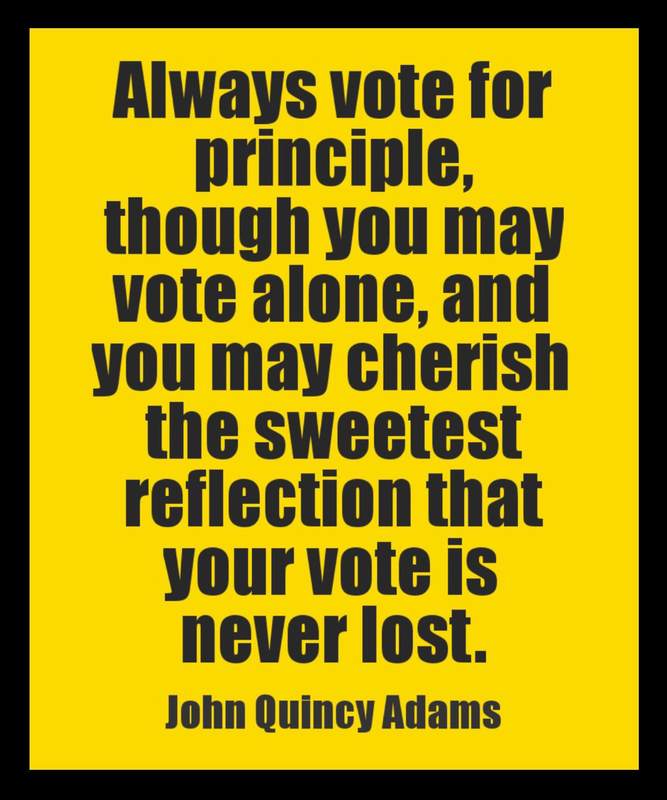 I refuse to violate my principles and vote for Donald Trump. It’s interesting that the statement “if you don’t vote for Trump, you’re voting for Clinton” assumes that if Johnson (or any other 3rd party candidate) didn’t exist, that I’d be voting for Trump. But this is a false assumption. If only Trump and Clinton were on the ballot, I would probably not vote. But perhaps they’d say that abstaining is voting for Clinton. Hello fellow conservatives, lend me your ears. There has been a lot of chatter as of late regarding whether or not we should support Trump in the 2016 presidential race. Well, after reading this post, I hope you will have no question as to whether or not you should support Donald Trump to #MakeAmericaGreatAgain. 1. We conservatives are always in favor of as little taxes as possible, and certainly do not support those stupid liberal tax plans. This is why I support Donald Trump’s plan to institute a progressive tax plan that looks very similar to a dirty hippy liberal’s tax plan but it certainly isn’t that because Donald Trump is a conservative. I mean, look at it. It is definitely not your typical conservative tax plan but that’s fine. If you’re tired of #FeelingTheBern of liberal tax policies, we should embrace Trump’s liberal tax policy and slap a conservative label on it. If I’m going to get a liberal tax policy, I’d much rather FeelTheTrump than FeelTheBern. This entry was posted in Liberty, Politics and tagged Donald Trump, Libertarianism, Politics, President. Hey! I just wanted to let you guys know that I have officially begun a bi-weekly apologetics column at TheologyMix! It is called “Come Let Us Reason” (from Isaiah 1:18) and they even made a super cool logo for it! This entry was posted in Announcements and tagged Apologetics, Christianity, Knowledge. There are a whole lot of people who are claiming that the Planned Parenthood shooter was a Christian. If this is the case, consider me a part of the Christian community who publicly declares my abhorrence for his behavior. Given where the crime was committed, there is a good reason to think that this man was against abortion. If this is the case, please consider me (yet again) a part of the pro-life crowd who is vehemently against this kind of destructive foolishness. But let’s say that we don’t know the motives behind this man’s behavior. I am *still* going to be a part of the crowd who publicly denounces this behavior as irrational and objectively immoral. You know what I don’t want? I don’t want this to turn into a turf war. But sadly, that’s how human beings are, I guess. Everything has to be turned into some kind of tribal warfare between competing factions. Can’t we all just recognize that this behavior is immoral? Let’s all recognize it as immoral behavior, together, as a human community. There’s no need to point our fingers and pretend that every single member of group X needs to denounce every single bad thing done by anyone claiming to be a part of group X. And yes, group X might mean Muslims. It might mean someone you disagree with. But more importantly, it might mean someone within your own tribe. Be morally consistent. Please. This entry was posted in Culture and tagged Culture. I’ve recently been in several discussions where I defend what the Bible says against skeptics. Now, you might be thinking, “Uhm… yea, that’s what apologists like you do,” and you’d have a point. I’m not only defending what the Bible says; I’m defending the idea that the Bible actually says anything at all. The skeptics aren’t denying that there are words on the page, of course. But they are denying that there is a proper interpretation of those words. They are [apparently] under the impression that the Bible isn’t actually saying anything objective at all, and that all (or most) interpretations are somehow equally valid. As a side note, I am amused by this. These same skeptics are the ones who point to passages in the Old Testament in an attempt to say that God is behaving immorally. But their arguments rely upon the fact that there is an objectively correct interpretation of Scripture. The skeptic must be consistent; either the Bible does have an objective meaning, or it doesn’t. You can’t have it both ways. 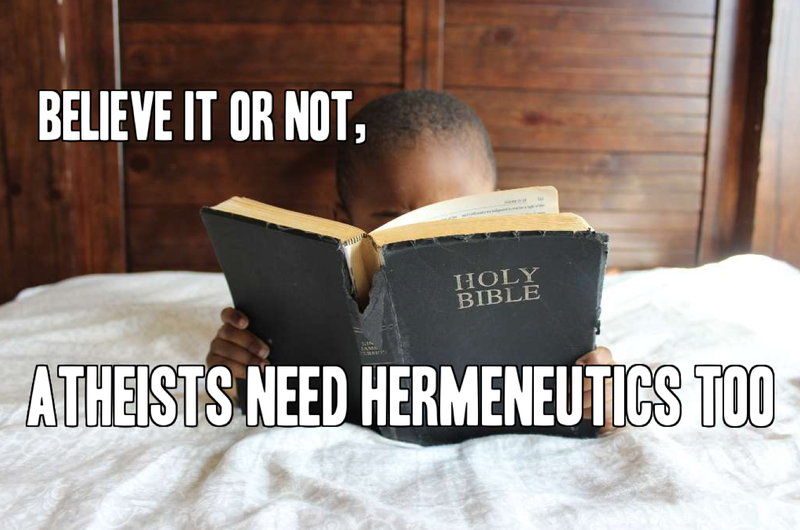 If the Bible is saying something objectively testable, our goal (and the goal of proper hermeneutics) is to understand what the Bible is actually saying. The Bible claims to be making statements about [historical, spiritual, theological, etc] reality, and can therefore be tested. On one hand, I guess I sort of understand the confusion. After all, our post-modern-esque culture tends to rip verses out of context and apply them where they don’t actually apply. Christians do it when they take Jeremiah 29:11 and apply that promise to themselves. Westboro Baptist people do it when they… well, they do it all the time. Every single sign held up by someone over at the WBC is an example of bad hermeneutics. This entry was posted in Christianity, Theology and tagged Atheism, Bible, Christianity. Several years ago I watched and listened for anything I could understand during a debate between a handful of presidential hopefuls. I did not know much about politics, economics, foreign policy, or anything else they were talking about. But I do remember being angry when I heard something I disagreed with. … or thought I disagreed with. The real story is that I was ignorant and overwhelmed. I wasn’t angry because the people were saying things I disagreed with, I was angry because I didn’t have the slightest clue what I was talking about. I didn’t know which political perspective was correct because I didn’t know which news sources to trust or which political philosophies were consistent. Everything seemed loaded with assumptions and I didn’t know how to discern right from wrong. And given my interest in epistemology, this really frustrated me. But I gave up politics for a little while. My ignorance forced me into apathy. If I didn’t know anything about it, why should I care? I’ll let other people figure out that mess, I thought. Now fast-forward about a year. I was on my way back to work after lunch and I got pulled over. As I was pulling to the side of the road, I thought this should be interesting. My inspection is up to date and registration is fine. I was not speeding. My phone is in my bag. There is no reason why he should be pulling me over right now. “License, registration, and proof of insurance please”, he responded. 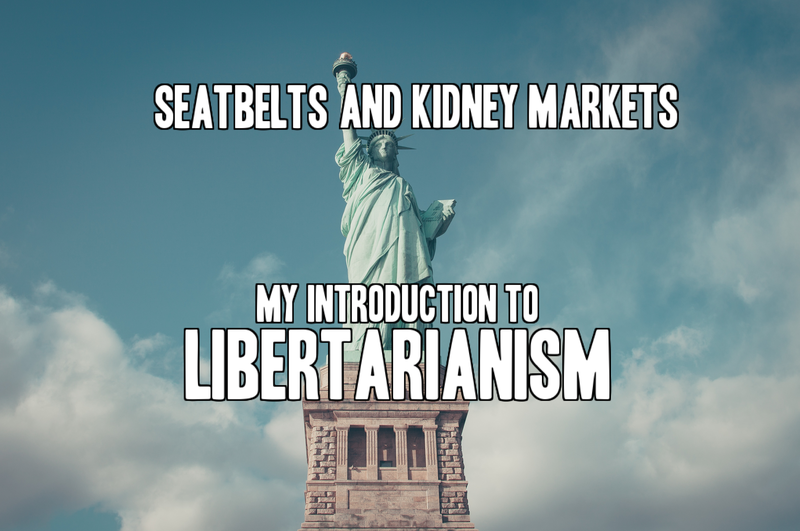 This entry was posted in Liberty and tagged Libertarianism, Politics. The recent debacle surrounding planned parenthood has been… well, uproarious to say the least. Some people are saying that PP is selling organs for profit, some are saying that PP is not making a profit but using the money for processing fees. I am not going to try to parse through the competing information on this. What I want to do is something similar to what I did with my post on genetic engineering and human children… I want to go through the possible scenarios and come to a reasonable conclusion that can be applied, no matter what the truth of the situation is. This entry was posted in Bioethics and tagged Abortion, Bioethics, Biology, Ethics, Health, Philosophy, Science, Virtue Ethics. 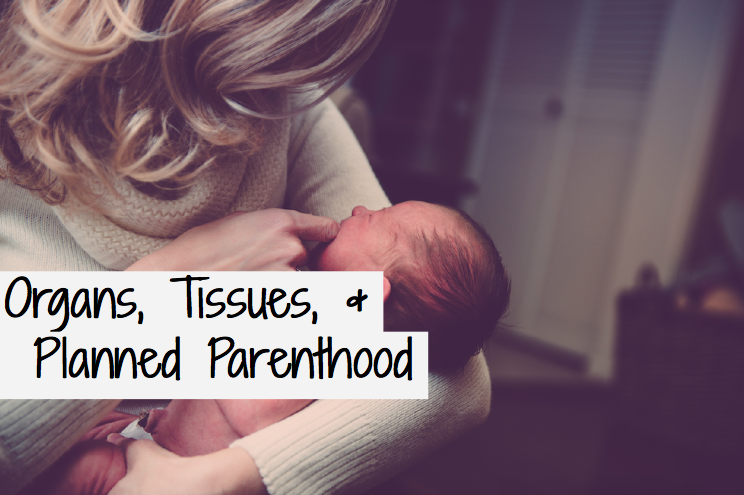 Who Cares if Planned Parenthood Is Selling Fetal Body Parts? God: The Ever Receding Pocket of Scientific Ignorance?